One Year Later, Did Sony Keep Their E3 2010 Promises? E3 is a den of promises. Promises sell products. And according to the cynics of the world, promises are meant to be broken. Yesterday, we took a look at the promises that Microsoft made at last year's E3. Today, we scrutinize Sony. Did their PS3 and PSP-related promises bear out, or were we left feeling betrayed? We criticized the company in 2010 for having been too ambitious, for indulging in overstatements ("2009 will be best year ever!") and for displaying too few live demos. One Year Later, Did Microsoft Keep Their E3 2010 Promises? President and CEO of Sony Computer Entertainment Kazuo Hirai pledged at the outset of the press conference that 2010 would be remembered ten years from now as the "year that Playstation brought authentic 3D to the industry." Verdict: Sorry, but I'm going to disagree with Hirai. The transition to 3D has been incremental and hardly spectacular – because not enough of us are using it. While some of 2010's most well-received PS3 titles did feature stereoscopic 3D either at launch or as a DLC addition, I think it would be a gross exaggeration to suggest that 3D was the motor-force driving the positive reception of these titles. ...when "every PS3" becomes 3D-enabled after "a system update" in the coming months. Verdict: Yes. No debate here. In September, stereoscopic 3D became available to all PS3 users via a firmware update to version 3.50. Additionally, Hirai emphasized that the PS3 was and would be "the only platform with native 3D gaming." Verdict: Debatable. There is no question that the Xbox 360 featured titles this year that supported 3D – Crysis 2 and Call of Duty: Black Ops among them. But we've read that those and other 3D-enabled 360 titles were "rendered using 3D techniques based on the principle of two distinct images crammed into one 720p framebuffer" and not the PS3's " full-on HDMI 1.4 stereoscopic 3D in the 1280x1470 twin 720p framebuffer configuration." Microsoft didn't make it a crucial part of their sales strategy, but some form of 3D was indeed (albeit quietly) available. Hirai touted that we would be seeing more than 20 titles supporting native 3D by March 2011—among them Super Stardust HD, Pain, Motostorm Pacific Rift, and Wipeout HD. Verdict: He wasn't bluffing. Sony managed to pump out roughly 30 titles by the March cutoff date, all of which supported native stereoscopic 3D. Granted, the titles greatly varied in scope – jumbled together in that tally are PSN-exclusives like High Velocity Bowling and blockbusters such as Killzone 3. Nevertheless, I think we can consider this promise as having been met. We were promised that these exclusive games (Motorstorm Apocalypse, Killzone 3, The Sly Collection, Gran Turismo 5) as well as a cluster of 3rd-party biggies (Crysis 2, Mortal Kombat, Shaun White Skateboarding, Ghost Recon: Future Solider, NBA 2K11, Tron Evolution: The Video Game) would all be given the 3D deluxe treatment. Verdict: Close, but no cigar. Blame Ghost Recon for throwing this particular promises off its tracks. But as that title has yet to be given a firm release date for any platform beyond Q4 of this year, we can't begrudge Sony this misstep. Before Hirai ceded the stage, he promised that the following titles would pair 3D-tech with PS3's brand-new Move functionality: The Fight: Lights Out, EyePet, Tumble, MLB 11: The Show. Verdict: Yes, yes, yes, yes, and yes. No broken promises here. So far, so good, huh? Peter Dille took the stage to discuss Sony's vision of bringing motion-controls to the PS3 platform. He assured us that Move would appeal to "core" gamers as well as those with a diet for casual fare. The buttons, he claimed, would be "critical to precision" — and a key advantage that would distinguish Move from competing technology. Moreover, word was that games from Sony's 1st-party software lineup would be priced each at $39.99. What ever happened to Sorcery? Lavished with an enormous chunk of valuable stage time, Move flagship title Sorcery was given a spring 2011 launch window. Its developer took the stage to demonstrate the game mechanics, and it would have been natural to assume that it was one of Sony's most anticipated Move-enabled games. Verdict: Sorcery is nowhere in sight—and the release date has yet to have been officially moved ahead. One wonders: has Sorcery been canceled? Stockings stuffed with Move games – more than 40 of 'em! We were promised 15-20 Move-compatible titles available on day one, with more than 40 becoming available in time for the holidays. Verdict: Half true. Unfortunately, by our count only six titles were available for Move at launch – a good measure short from the dozen plus promised to us at E3. But Sony did make good on the holiday claim. As of December, Sony bragged that its library of Move-supported titles had swollen to close to 50. In addition to those games initially developed with Move specifications in mind, Sony listed a handful of high-profile titles would receive patches enabling them join the bandwagon: Toy Story 3, Tiger Woods PGA Tour 11, Heavy Rain, and Resident Evil 5 Gold Edition. Verdict: Yes indeed. For better or worse, all of these games received the promised upgrades well before the close of the year. Jack Tretton wanted to make clear that the PSP wouldn't be going anywhere, and that the console's core technologies would keep the system going for "years to come." We were told that we would witness the release of over 70 titles by December, and that the "Meet Marcus" advertisement campaign would breath new life into the sales of the system. Verdict: 70 titles?! We counted only 29! That's failing rather short of the mark, Sony. Granted, we met Marcus, but he's been looking alarmingly MIA lately. Hey, Whatever Happened to Marcus, the PSP Mascot? Tretton did reveal some specific PSP titles, Invizimals being at the top of the heap. We were told that this "full-featured" game would use a camera peripheral to bring an "augmented reality" experience to the system. On a less unconventional note, we were shown a trailer for God of War: Ghost of Sparta, and were told to expect Kingdom Hearts: Birth by Sleep, Ace Combat: Joint Assault, The 3rd Birthday, and UFC 2010 Undisputed among others. And just in time for the holiday sales boon, Tretton pledged that a pair of PSP bundles would become available, one for God of War: Ghost of Sparta and the other for Invizimals. Verdict: You're okay here, Sony. No broken promises or broken hearts. We've seen all of these titles hit the streets, though whether the "augmented reality" offered by Invizimals really caught on is doubtful. In the pre-breach days of E3 2010, Sony was mostly concerned with promoting its new subscription service Playstation Plus. We were told the service would be priced at one year for $49.99 (or 3 months for $17.99), and would give subscribers access to early demos, priority invites to select betas, PSN games, themes and minis, automatic downloads, and PSN store discounts. Additionally, Sony would be providing users with 3 months for free, and in its first month, the service would include Wipeout HD, a trial for inFamous, two minis (Field Runners and Age of Zombies), the PSone Classic Rally Cross, among other items. Verdict:Yes, this has all turned out to be true. There is, of course, that pesky security-breach business nagging at my mind—but of course, Sony doesn't enjoy clairvoyance, as far as I'm aware. By far the biggest surprise for attendees of Sony's keynote was the unannounced appearance of Gabe Newell, and his revelation that Portal 2 would not only be released on the PS3, but that it would be "the best version on any console." He alluded to the fact that users would have access to the Steam cloud, and would enjoy automatic updates to their copy of the game. Verdict: Yes. To the delight of PS3-owners the world over, this particularly big promise came to fruition. Now, whether or not the console received the "best" version is a qualitative judgment I'm not prepared to make—but the Steam overlay did arrive, as promised. The SCEA President introduced us to a number of multi-platform, 3rd-party titles that nevertheless would be receiving significant content exclusive to the PS3. Among them were Medal of Honor and Dead Space 2, both of which were due to be bundled with an additional (earlier) franchise game at no additional charge (Medal of Honor: Frontline and Dead Space Extraction, respectively). Verdict:Sony scores another point. All of the above promises of exclusivity were honored, with Assassin's Creed Brotherhood and Mafia II also receiving content unique to the platform. They didn't explicitly slap it with a release date, but Sony dazzled with a lengthy trailer for Square Enix's MMO Final Fantasy XIV, and touted it as one of many games that would contribute to a "banner year" for the Playstation brand. 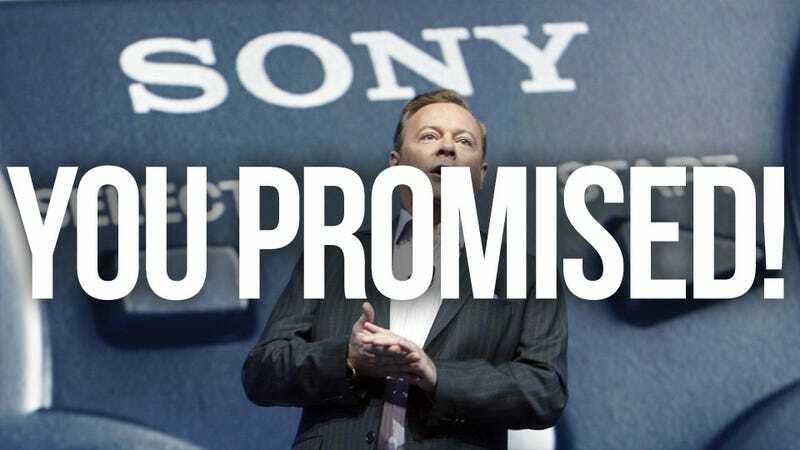 Verdict:Maybe this wasn't your fault, Sony – but a broken promise is a broken promise, no matter how you add it up. All bets are off as to when Final Fantasy XIV will see the light of day on the PS3; overwhelmingly negative press and a dissatisfied install base resulted in a reshuffling of the development team, and this promise has been pushed back indefinitely. Final Verdict:You did okay, Sony. Pat yourself on the back. The case of Sorcery does unfortunately demonstrate that a live demo is not necessarily an inviolable proof that a game will see release—but in the scheme of things, I'm going to let that slide. Portal 2 was an enormous coup for the company, and we did end up seeing a hefty amount of content and titles exclusive to the console. Yes, the 3D business was a whole lot of hot air; but only time will tell whether that particular piece of tech establishes a foothold, or fizzles away as short-lived fad.